Sun City Peachtree is a magnificent Del Webb community near Atlanta, Georgia. This 3,387 home community includes a clubhouse, 18-hole golf course, and a renowned lifestyle. Retirees from across the country have flocked here to be a part of the next big active adult community in the Southeast. Sun City Peachtree is spread across 1,700 acres of lush pine forests and rolling hills. It is conveniently located 35 miles south of Atlanta in Griffin, where small-town charm meets big-city convenience. This ideal location is quietly tucked away from the traffic and congestion of Atlanta, yet conveniently close to everything the city has to offer. With world-class amenities, a socially active lifestyle, and finely crafted ranch homes, Del Webb in Griffin, Georgia offers the perfect place to live life to the fullest. Club Peachtree is this community's fabulous amenity center that opened in early 2009 and is 45,000 square feet. It hosts an abundance of amenities and clubs tailored around the needs of today's active adults. It includes a state-of-the-art fitness center that has the latest high-end cardiovascular and weight-training equipment. The fitness center is surrounded by an indoor walking track, and is adjacent to an aerobics and dance studio as well as an indoor lap pool. There are also a variety of arts and craft studios, a billiards room, card room, library, computer lab, and ballroom. A large sundeck overlooks an outdoor resort-style pool and spa that features a separate area for lap swimming. Club Peachtree also includes other desirable amenities such as a 146-seat movie theater with a stage. This community in Griffin, Georgia is filled with an exciting array of sport courts and activity areas. 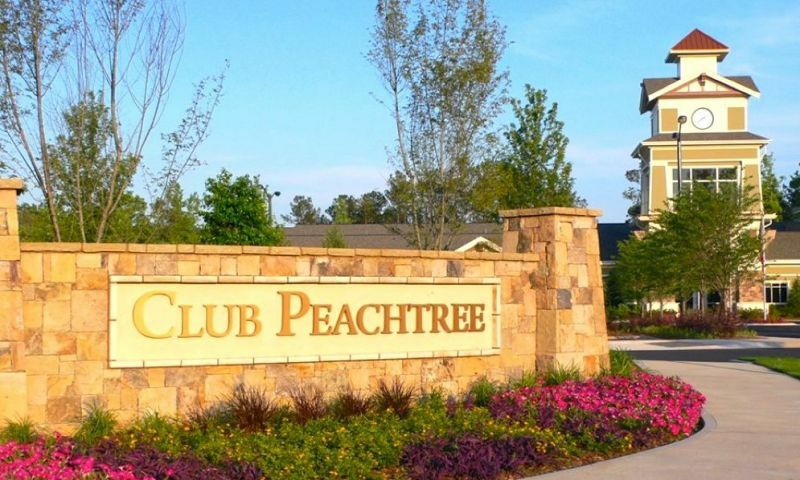 Surrounding Club Peachtree are basketball, volleyball, pickleball, and bocce ball courts. The tennis center includes five lighted clay tennis courts including a stadium court. An outdoor amphitheater hosts a variety of summer concerts and movies for residents to enjoy. Plus, there are miles of scenic walking and biking trails that wind through botanical gardens, preserved forests, and the neighborhoods of the community. The Club Corp Sun City Peachtree Golf Club designed by Gary Stephenson recently opened amid rave reviews. The 18-hole, par-72 course features elevated tees and generous landing areas. The 6,822-yard course includes five sets of tees, making it playable for golfers of all skill levels. Bent grass greens, rolling fairways, and towering trees make the course as beautiful as it is enjoyable. Members of this private course enjoy access to Canongate's 23 golf courses around metro Atlanta. A small entry fee and minimal monthly dues make joining the Sun City Peachtree Golf Club a logical choice for serious golfers. Construction of the community began in 2007 and Del Webb plans to build over 3,300 homes. On a cost-per-square foot basis, the home prices in Peachtree are practically unbeatable. Homebuyers can choose from both new construction homes and a growing assortment of pre-owned resale homes. The homes have been designed around the needs of active adult buyers. Wide, open great rooms, airy kitchens with energy efficient appliances, and ample outdoor living space are included with every home in this community. Homebuyers can select from a variety of single-family ranch floor plans that range in size from 1,103 to 2,722 square feet. All homes feature one to four bedrooms, one-and-a-half to three bathrooms, and an attached two to two-and-a-half-car garage. The larger floor plans offer unfinished basements and loft options with additional bedrooms and bathrooms. Many of the homesites available now include scenic views of the golf course, mature trees, or open space. The lifestyle offered here is scarcely matched by any other active adult community in the Atlanta area. A fitness and activities director is there to ensure that residents have the ability to lead a well-rounded lifestyle. Whether your idea of activity consists of social clubs, sports teams, or simply mingling with friends at the various neighborhood events, there is something for everyone in this active adult community. The residents here can custom build a lifestyle tailored around their interests. There are several dozen clubs and interest groups here that include everything from arts and crafts to tennis and golf. Other popular clubs include numerous card clubs, a travel club, dancing, performing arts, continuing education, music, and much more. A variety of fitness activities such as aerobics, yoga, water aerobics, and Zumba are also available. Regardless of your passions in life, you are certain to find other like-minded individuals at Del Webb in Griffin who share your desire to get the most out of life. With everything that this community has to offer you might never feel the need to leave. But with the community's proximity to Atlanta, all the big-city shopping, culture and entertainment you crave is just a short drive away. Places like the Georgia Aquarium, Fox Theater, or the Margaret Mitchell House are fun to visit when guests come to town. There is plenty of shopping nearby including South Point Mall, Tanger Outlet Mall, The Avenues in Peachtree City, and the many shops in downtown Griffin. Spalding Regional Hospital, Emory, and Piedmont Atlanta Hospital all offer top-notch healthcare near the community. Plus, Atlanta's Hartsfield-Jackson International Airport is only 30 miles away, making trips to other areas of the country a breeze. Sun City Peachtree in Griffin, GA offers more than what you'd expect from an active adult community. Club Peachtree - 45,000 Sq. Ft. There are plenty of activities available in Sun City Peachtree. Here is a sample of some of the clubs, activities and classes offered here. The Azalea Collection offers eight models ranging from 1,103 to 1,424 square feet with one to three bedrooms, one-and-a-half to two bathrooms, and an attached two-car garage. These models are among the smallest offered in the community and were designed with active adults in mind. The Dogwood Collection offers eight models with square-footage ranging from 1,594 to 2,722. These homes offer two to four bedrooms, two or three bedrooms, and an attached two-car garage. Residents love these homes for their covered lanais and optional loft spaces. The Magnolia Collection offers models ranging from 2,051 to 2,597 square feet of living space. These homes have two to three bedrooms, two to three bathrooms, and an attached two to three-car garage. The community is a little remote, but that's why I love it. The clubhouse is fun to hangout in and the tennis courts are in great shape. I love walking the streets and talking to my fellow neighbors! My wife and I moved here from California in November 2010, and we loved it right away. We purchased "ready for move in" house, so we got a really good deal on it. Things haven't worked out exactly as we had hoped, but that has nothing to do with the house or the community and everything to do with my wife's health. With that in mind, the medical options in the area are outstanding. We would do it all again if we had the choice. Our realtor was wonderful to work with in helping us find a home that met our needs. Our neighbors have been very good so far -- very friendly and have welcomed us to the neighborhood. This has been very reassuring to us. The amenities facility seems wonderful with a great variety of things to do and a large number of clubs and activities to choose from. We would gladly recommend Sun City Peachtree. We felt at home the first time we drove into the area and have not looked back. We stopped in several times over a year during vacation trips, and even took advantage of the Staycation offer before we purchased resale. We are blessed to have already made so many friends here. The location of SCP is perfect - close enough to Atlanta, the coast, Florida parks, etc. The magic of SCP is the people, the activities and the affordable location. Looking forward to a long and enjoyable fun filled retirement. We feel and look 10 years younger already. And our 2 puppies love the home as well as our daily visits to the dog park. We just moved in to our home at Peachtree about six months ago and are completely happy with our decision to move here! While we also thought the location might be too "out in the sticks" for our taste, we've learned to adjust really easily. We spoke to a lot of the residents before making the decision to move here. What we kept hearing over and over was that Peachtree had a strong sense of community, pride of ownership and friendly neighbors. I've got my schedule down to head to town for all the groceries, gas, etc typically on Monday morning so I can get back and enjoy all that the community has to offer. We really don't need to go anywhere because everything we could ever want is right here in our backyard! Visited Sun City Peach Tree June 2013. It is a beautiful location, and the homes and folks living there were very welcoming. The area was beautifully landscaped and didn't have that "cookie cutter" look, and the prices were reasonable. HOWEVER....the surrounding area has absolutely nothing to offer that you don't have to drive 15-20 minutes to get to, and this includes grocery stores, gas station, bank, etc. Just too remote for my taste. Definitely worth a visit!! I moved to SCP from a major metro area in 2009 and quickly adjusted to the peaceful nights and activity filled days that characterize this wonderful community. The well built homes offer real value at an amazingly low cost, with both new and resales available to fit any budget. And while the amenities are great, it is the residents that really make living in SCP the opportunity of a lifetime. Diverse in background and from all parts of the country, SCP residents look out for each other and give back to the larger community in numerous ways. Come be part of this growing community....its a decision you won't regret. 55places.com is not affiliated with the developer(s) or homeowners association of Sun City Peachtree. The information you submit is distributed to a 55places.com Partner Agent, who is a licensed real estate agent. The information regarding Sun City Peachtree has not been verified or approved by the developer or homeowners association. Please verify all information prior to purchasing. 55places.com is not responsible for any errors regarding the information displayed on this website.